www.inbministry.in/runforunity - Greetings! 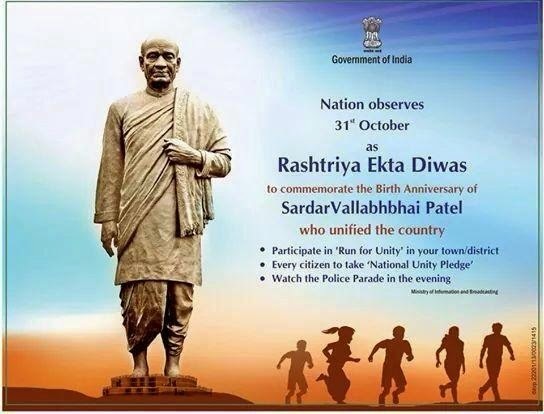 There will be a national marathon on the birth anniversary of sardar vallabh bhai patel. One more interesting thing is that our honorable prime minister shri narendra modi ji is going to take part in it and he will join us. Update :- Like last year, This year too, Modi government has decided to celebrate Sardar patel's Birthday as Rashtriya Ekta Diwas, each state will organize Marathon Run in state capital. 31st October 2015 is a birth anniversary of sardar vallabh bhai patel and we all are going to run in marathon in the memory of him. The marathon will be also called "Run for Unity". You can also call it "Ekta Daud". This marathon will spread a message of good governance and national integration. Sardar vallabh bhai patel has done a great work for our nation and it is now our turn to do something in his memory. Make sure you are going to participate in this marathon Run for Unity on 31st October 2015. Moreover, the information and broadcasting ministry said that the government of india has decided to celebrate the birth anniversary of sardar vallabh bhai patel on 31st October 2015 as a "Rashtriya Ekta Diwas". You can also call it "National Integration Day". In addition, the government has decided to make Rashtriya Ekta Diwas a very famous mass movement towards assuring national integration in india. Sardar vallabh bhai patel is one of the greatest statesmen of our nation. You can do something for your country and in the honor of him by participating in a marathon. One more thing you can do is take part in a "Run for Unity logo contest". Upload your logo on the official website http://dv.inbministry.in/runforunity and wait for the results. Winner of the contest will get a first prize of 50,000 rs. and 3 consolation prizes will be there. The last day of submission for the contest is 7th November 2015. You need to submit your logo on this website on or before this date. To participate in the contest go to the link given above, read the terms and conditions, and register yourself. Then upload your logo. Run for unity this 31st October 2015 and feel proud to be an indian. For any questions or doubts please leave comment below.